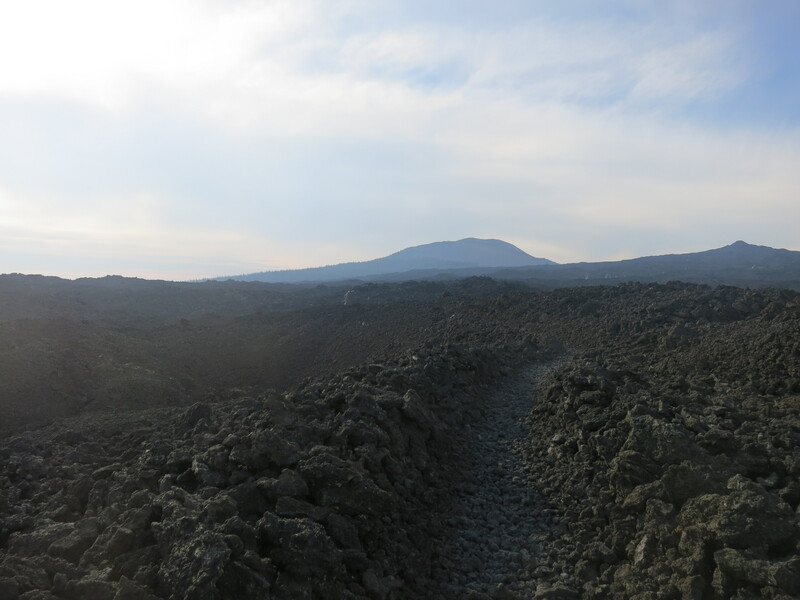 Day 119: Back into the Lava Fields! Last night, I had written a message to my doctor friend who had called in a prescription for my giardia when I was in Lone Pine. I told her that I still wasn’t feeling well and that I was pretty certain that I had been suffering from C. Dif for months now. I asked if there was any possibility of her prescribing one of the antibiotics that Allyson’s sister said I needed. While I was unable to sleep, I checked my phone to see a terse message from her saying she could not. Oh, well… It was at least worth a try. Allyson is an early riser and was having a hard time lying in bed, so I got up for her. She said that she had a conference call in an hour and was going to go grab some breakfast in the lobby first. I told her I would go with her. Connie was still asleep. I ate a bowl of raisin bran with my cup of coffee and then we headed back up to the room so Allyson could get ready for her call. Connie opened her eyes when we opened the door. She had been sound asleep and looked so peaceful! I wished I could sleep like that! While Allyson prepared, I went back to the lobby to eat with Connie. I brought my baggie of guatamalan tea and Old Man’s Beard with me to make my tea, which Connie was curious to see. This time, I ate some waffles. I felt much more relaxed and at ease sitting with Connie. Some people are just easy to be around and it doesn’t matter if you are talking or not. The space is just natural and accepting. Because she felt like she needed to get back on the trail sooner than later, she called the man who had given her a ride to the trail a few days ago and asked if he could take her again. She had to quickly pack up her things and get ready, so we didn’t have time to relax or chat to my dismay. Back in the room, we said goodbye, hoping we would see each other again soon. Allyson had now finished her call and was hungry for a real breakfast, so we headed down the road and found a nice place nearby. My omelet looked amazing, but my stomach quickly started hurting again and I wasn’t able to enjoy it. Suddenly, Allyson realized that check-out time was just minutes away! I started to panic. I hadn’t had a chance to take a shower this morning or sort through all of my resupply items! I had hoped to find a place to get my haircut in preparation for the wedding, as well, knowing that this would be my last real town stop on the trail. I also needed to buy a plane ticket and get to the post office to send out my boxes of extra stuff. We were able to get an extra hour in the room, and then we took my stuff down to the lobby to start sorting. I had a lot to go through! First, I needed to divide up my probiotic pills, go through my maps and guidebook pages, pack my food bag for the next 120 (!) mile stretch, decide what I wanted to send further up the trail and where the best place to send it was, and what was worth sending back home. All the while, the pain in my stomach was growing worse and worse! Then, I needed to look up prices for flights and think, think, think…! I was now committing myself to finishing the trail by a certain date. If I wanted to get to the wedding, I would have no leeway for storm days or any days of rest. I would need to do high mileage days throughout Washington without knowing what the terrain would allow. 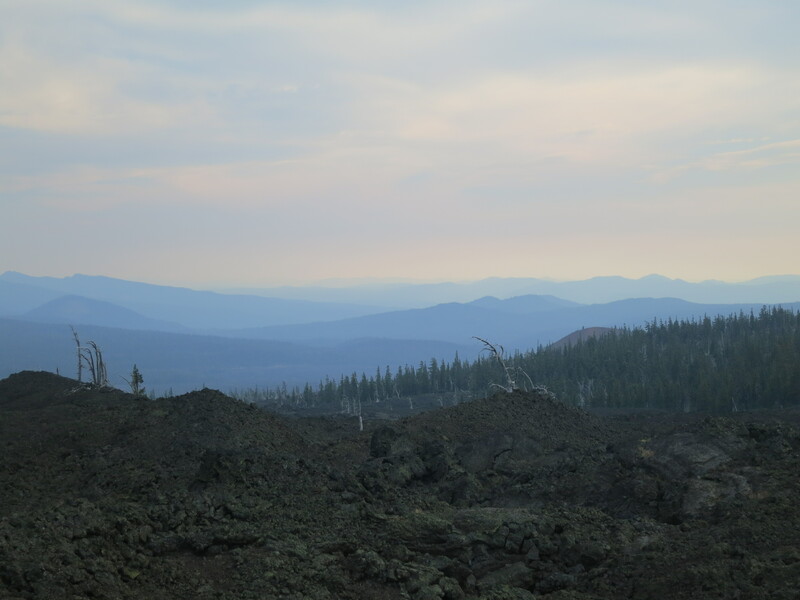 (I had heard that Washington is tough and steep- second in difficulty to the Sierras). I sent a message to Checka and she wrote a very heartful message back that brought tears to my eyes. She did not want me to rush or stress to get to her wedding and said that the years of friendship we had in the future was more worth it than this one day. Being the stubborn person that I am (and not wanting to be selfish), I went ahead and bought the plane ticket so that I could make it to her wedding. 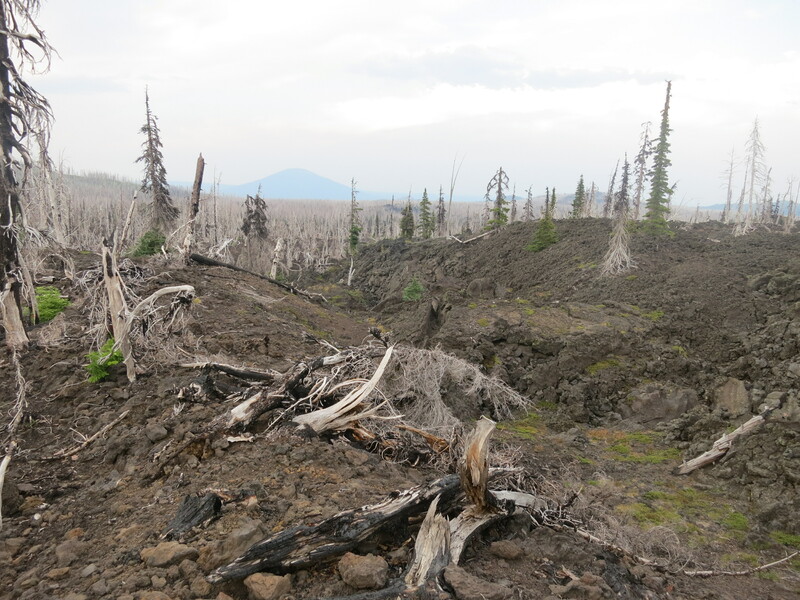 Then, I wrote a quick update about what was happening with my hike to post on Facebook. By now, it was late in the afternoon and I felt bad that Allyson had to sit around while I attended to all of my chores. Connie had sent a text to Allyson, saying that she had somehow dropped her maps on the trail and asked if I could buy her a new set. All I could do at that point was make copies of my own pages and give them to her when I caught up to her. We loaded up the car and headed out to buy new water bottles for me and find something to eat for her. I was in too much pain to eat anything. I don’t think Allyson understood because she insisted that I tell her what would be appeasing to my stomach. We ended up buying some peanut butter and chocolate frozen yogurt smoothies which we drank on the way to the trail, but by that point, nothing could make my stomach feel better. Even after emptying all of its contents, I still had clear diarrhea and a lot of pain. We stopped to use the outhouse near the stone tower and I thought I recognized the green jacket and bandana of the hiker on top. I wanted to shout out, “Baxter?!”. Another hiker approached from behind the bathroom when we needed someone to take a picture of us. He asked if we were hiking the whole trail and I found out that he was a southbounder from France, named Poptart. I asked him if I would be able to hike 25 mile days in Washington. He hesitated for a few seconds before saying that it might be possible since I already had my “legs”. I smiled, feeling the tiniest bit relieved, but still feeling immense apprehension about my ability to do this. We walked back down to the trail and found Baxter and a friend of his sitting on the side of the road. It was really him, after all! At first, he didn’t recognize me, but was then happy to see me. He asked about my stomach and I explained that I found out what antibiotics I needed and that I had written to two doctors I knew from home, both of whom turned me down. He was sorry to hear it. When Allyson mentioned the name of the antibiotics I needed, Baxter asked, “Cipro? That’s what you need? I have a prescription of that on me. Do you want it?” Baxter was a nurse and was given three different prescriptions from his co-worker doctor for several things that he might need while on the trail. Wildcat had the other antibiotic with her. She was now in town. I found the difference between a hiker’s willingness to help out another hiker in need and the willingness of people living in society who had the power to help, but ultimately would not, quite astounding. I also found the timing of this encounter to be extraordinary. What if I had left town an hour or two earlier? I would have never run into Baxter. Allyson wanted to hike a couple of miles with me before she had to turn back and drive to the bus station to meet her boyfriend. Although my stomach was still in great distress, walking felt good and helped to create a different and better environment to interact in. 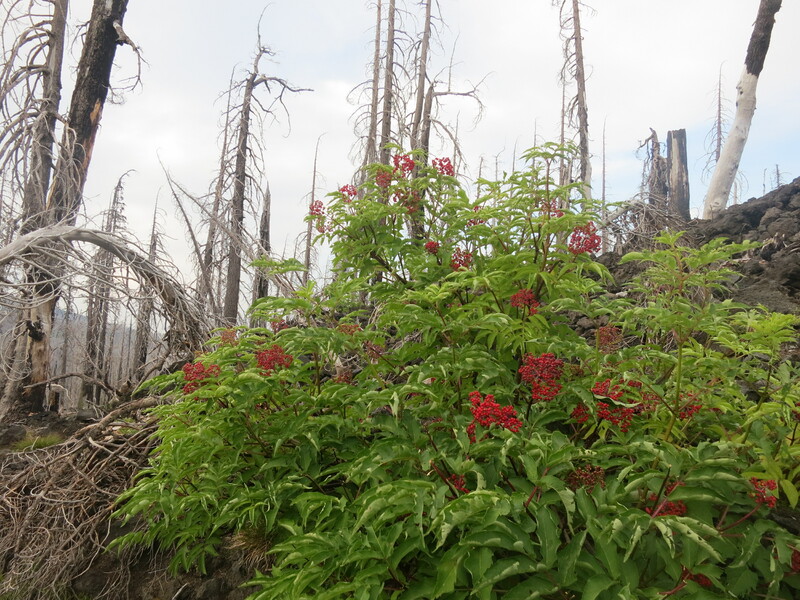 I felt bad that it had taken me so long to sort my things and take care of my business, as Allyson would have liked to hike more of the trail. When it was time for her to turn around, I was surprised to hear her say that she wanted to come out and hike a bigger part of the trail with me. 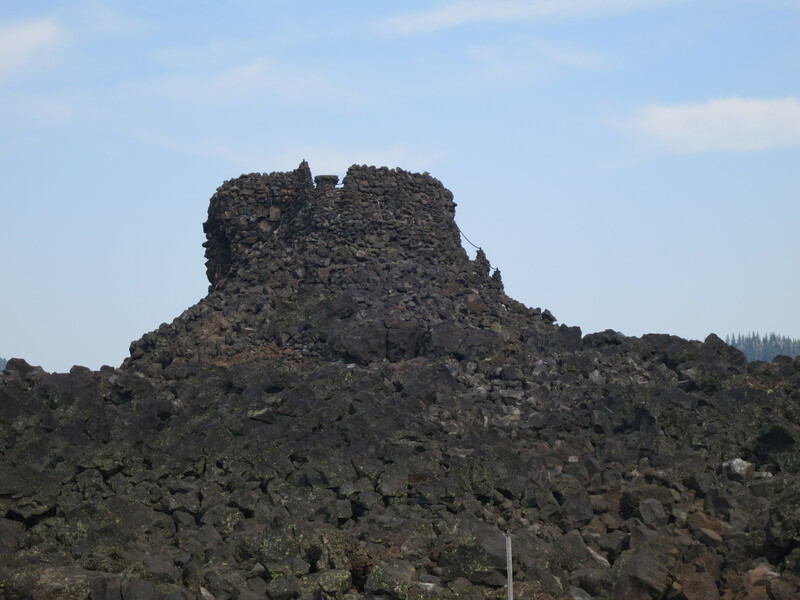 Even if she wasn’t able to do that, she wanted to meet me at Timberline Lodge. I took off my pack to give her a hug goodbye, which she didn’t seem to expect. I thanked her for helping me out and being my personal trail angel and then headed on as she jogged back. 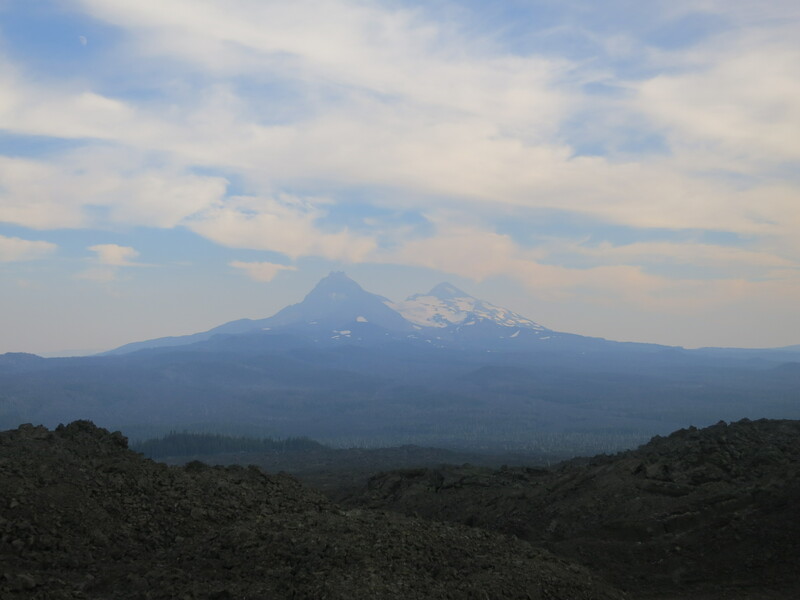 We had just crossed another section of volcanic rock and it looked like the trail was now headed back into the woods, where I was sure I could easily find a nice place to camp. 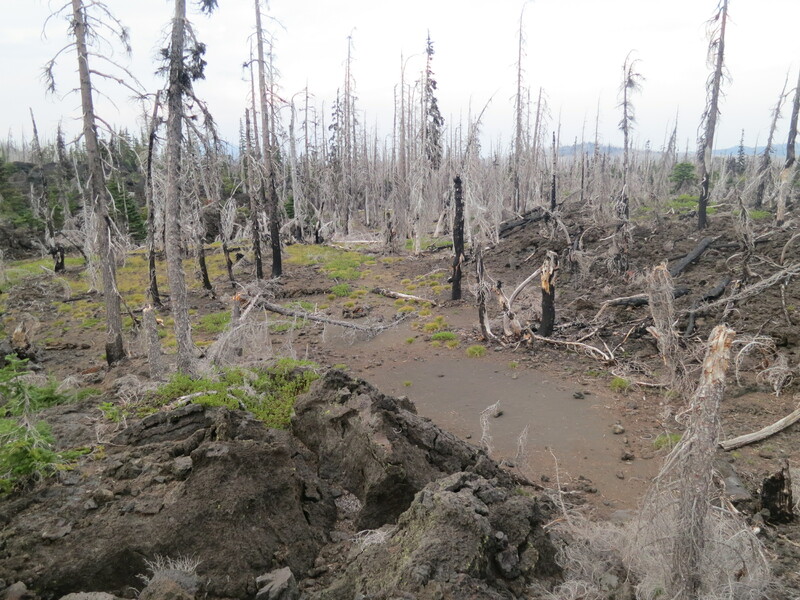 To my surprise, the woods were very short lived and the trail took me right back into the lava fields! Oh, dear… Finding a place to camp in this area was going to be a major challenge! I ended up passing by a very tiny spot that would be possible to cowboy camp in, but decided that I wanted to get in five miles tonight. I kept going. To my great fortune, I ended up finding a much bigger and better spot ahead! 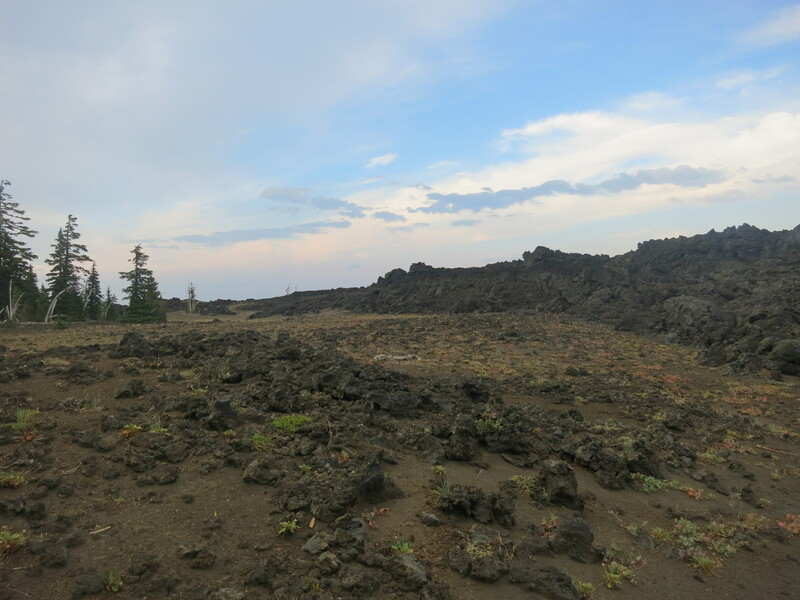 A nice open, flat space among the lava rocks! And there was still plenty of light out to set up camp! 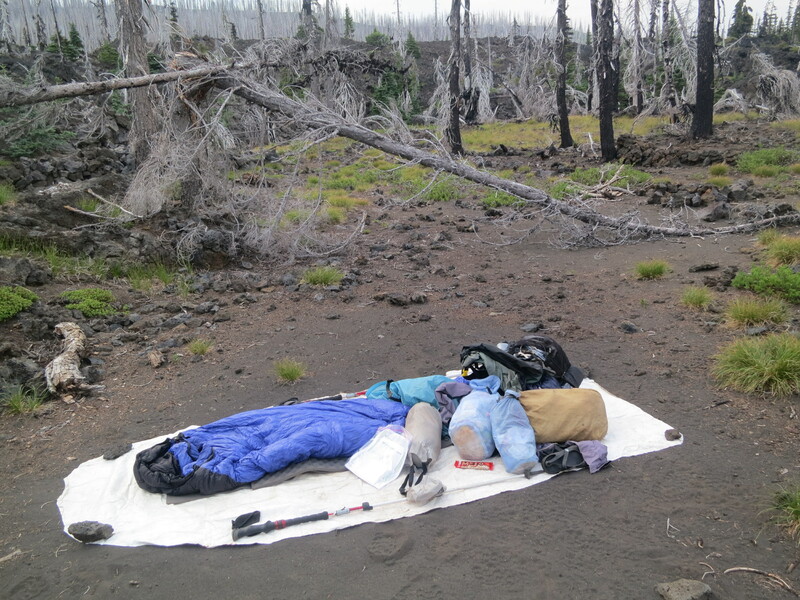 I spread out my groundcloth, sleeping pad, and sleeping bag and bundled up to protect myself from the cold wind. Then, I boiled water for my dinner of Lipton noodles which had looked so gross to me in the hotel room. They turned out to be really tasty, however- probably because they were something different! As I tucked myself into my sleeping bag, I felt completely content (other than my hurting belly). 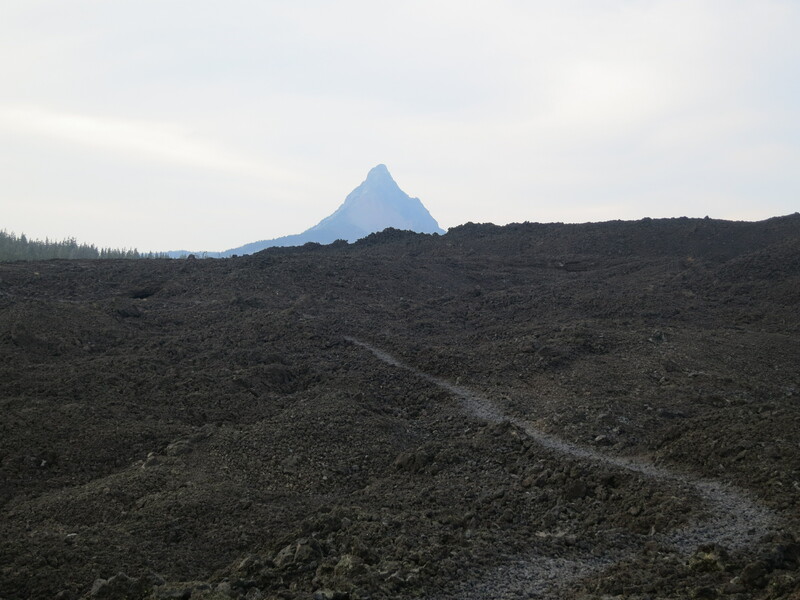 Here, in the harsh lava rock field, all alone in the dark, I was a happy girl. 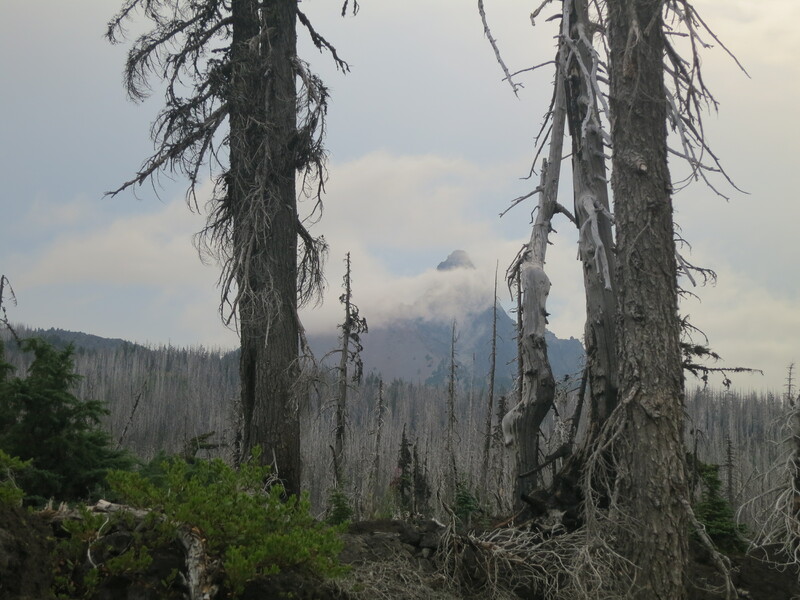 This entry was posted in Uncategorized and tagged Lava, Oregon, Pacific Crest Trail, PCT, PCT 2013 blog by Wendy. Bookmark the permalink.